Saturday dawned cold and drizzly but it was all roses inside the office at SMF with flowers sent by well wishers and trophies from Shai+ and other progeny; the sun came out in time for the luncheon and it became a bright and beautiful day in the valley. Henry and I were surprised by the turnout for the celebration; over 100 people came to help celebrate the event and from as far away as Michigan! One thing about Arabian horse folk, they love to see one another and see the horses! Tiffany, Jennifer and Daniel Schmidt and David Cains of Stonewall farm sign up in the gazebo (note the wet surface). It rained in the morning and cleaned everything so beautifully. When you live in a semi arid climate you celebrate moisture anytime! Henry is greeting Ron Palelek of Washington State in the background. Kelly Elm of Arroyo Arabians helping Christie to set up the “Wall of Shai”; many owners of Shai progeny sent photos and stories of their horses plus all the memory photos of the star himself. There has been so much time that has passed since he entered our lives that it was a bit of a shock to see the aging process with us humans; I can definitely say with assurance that Shai has aged much better! *Please see the stories from Martha White on Ibn Shai and his progeny, thank you Martha for sharing. I laughed a lot over them and rejoiced in how fortunate your horses are to be with you. The luncheon took place in the backyard of Office Manager Ann Marie Linn who is also one of Christie’s five sisters! Ann organized the wonderful food and just about everything else for our enjoyment! Henry welcomes everyone! Marion Richmond sent a note to Shai from his “Mummy”. The buffet was beautifully prepared and delicious besides. Caesar (Gerry Alexander’s Chiweenie dog) was really bummed out; he wanted to have a sandwich with the rest of the guests. Oh well he did get to sit on Sylvia Linn’s lap and have a nice rub! *Simeon Shai+ makes his first appearance with Emily Devers, Farm Manager for a special tribute toast given by Bruce Clark and Gerry Alexander in his honor. Ron Palelek also reminisced by sharing a memory of seeing Shai+ during a photo shoot outlined by the sun and reflected in the lake; he stated he would never forget that incredible image of Shai with his tail carried so high, the lighting and this proud and wise stallion. The original Shai Alliance was comprised of BruMarBa Arabian Stud (Bruce Clark and Gerry Alexander) and Vantage Point Farm (Ron Palelek). 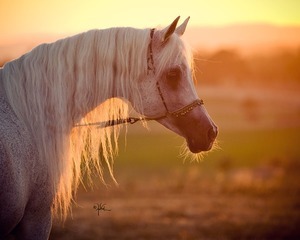 Under their guidance Shai became the only Arabian stallion to win both Canadian and US National titles, Scottsdale Champion Stallion and World Champion Stallion at the Salon De Cheval in Paris, France within ten months; a record unparalleled today. After the luncheon we all moved over to the large viewing arena to see the presentation of Shai+ progeny, grand get and great grand get along with the influence on the SMF breeding program. In total 17 horses were presented. It was noted by Christie that Shai+ has over 450 first generation foals and over 1000 second generation foals. He has achieved the status of Legion of Honor through the Arabian Horse Association and “Sire of Significance” from the Arabian Horse World magazine in recognition for his contribution to the breed as a sire. There are champions in more than ten countries sired by Shai and on almost every continent. His impact has been global in scope. The presentation began with Shaia+ an 18 year old daughter of Shai+ presented by Bruce Clark and bred by BruMarBa. Bruce always led Shaia+ to the show ring no matter where we showed the mare. This is one day he did not get emotional on his walk but smiled the whole time. Shaia+ who is known for being very calm and deliberate is also like her sire in that she loves an audience and she gave a super performance with Bruce; she even remembered all her old cues! I don’t know who looks more interested in where they are going, Shaia+ or Bruce? Can you see Henry grinning in the background by the gate? Her tail went up and she had to show she was excited by standing up on two legs not four. Shaia+ is in foal to SMF stallion, Ali Saroukh for 2009. Pretty amazing for 18 years old! Next is the Shai grandson Ali Sadiid pictured above with Emily Devers riding; he is a ten year old grey gelding (Christie’s horse). Sadiid has distinguished himself in Hunter Pleasure with amateur riders Cydney Cutchall (Christie’s niece who is now a professional trainer) and Madeleine Sims at the Egyptian Event (pictured below with Maddie). These horses are good representatives of the Spanish and Egyptian “Golden Cross”. Madeleine Sims pictured with Ali Sadiid 2008 Egyptian Event; this young lady learned to ride on Sadiid and he holds a very special place in her heart even over some National champion horses she owns. Emily Devers, SMF Farm Manager riding Suncatcher SMF (above) a three year old gelding is the fifth full sibling of this cross of BB Thee Renegade with Shaia+; He is in training at AB Training Center with Ali Brady. “Sunny” as Ali calls him will make a very nice Western Pleasure or Hunter Pleasure horse for a youth or a woman. Following this we showed Nejd Queen SMF another four year old recently under saddle in the very capable hands of Arroyo trainers Kelly and Rafael. This mare is not only gorgeous but so willing and when someone is not breeding her she may be a pleasure horse as well. Her dam PR Nile Queen is out of the mare Queen Anne’s Lace by Kamim, a beautiful blending of Egyptian and domestic bloodlines. Shai horses are intelligent, willing and athletic. time after being in training for two months. Rafael of Arroyo Arabians riding. Diva Family on the way to presentation. Shai Elation (*Simeon Shai x AK Dalulia by Dalul) straight Egyptian ten year old gelding. Proudly owned by Dr. Rex and Christine Wang. He is their companion horse and loves his job! Kelly Elm of Arroyo Arabians riding. BruMarBa Darkshai a 1998 Black Egyptian Sired stallion (*Simeon Shai x WCA Mon Cherie by Monogramm) bred by Gerry C. Alexander and proudly owned by Julie Vance. Darkshai is currently in training with Bill Porcher of Porcher Pleasure Horses. Watch for this handsome stallion in the show arena in Western Pleasure. He is representative of Shai crossed with Polish blood lines. Bint Example is a 2002 Chestnut Mare (Dreamcatcher SMF x Example by Barich De Washoe). She is a daughter of the famous BruMarBa Mare, Example who is the dam of El Perfecto by Val Hermoso; he is the senior sire at SES Planes in Spain owned by Marieta Salas. Bint Examples’ sire is Dreamcatcher SMF; a Shai grandson who is out of the exquisite mare Shaia+. Bea or “Barbie” as Kelly and Rafael nicknamed her during her training at Arroyo has a very important job at SMF; it is to be the Metz grand children’s horse. Bint Example is very confident in this role and takes her job seriously as you are able to see with three busy grand kids grooming her prior to a ride. A great granddaughter of *Simeon Shai+. This five year old mare is in foal to *Simeon Shai for 2009. Shadream was bred by Om El Arab International out of the international champion mare Om El Shadina sired by the late great, Sanadik El Shaklan. Not only does this mare represent the qualities of the Golden cross of Spanish/Egyptian blood lines she is a blending of two breeding programs here in the valley. Shadream was highly anticipated by Henry and Christie who planned an annual trip to the valley to visit Sigi and Janina just about the time she was to be born. It took Christie two years to talk Henry into purchasing the young mare and Mike Neal to say “You could be a National Champion with this mare”! One chapter of her story is that Henry achieved his first National Championship for SMF with Shadream in 2005 as AOTH during the first class of the show and on the first day of the show. She has a wonderful show record with Mike Neal as well; winning Regions III, X and XI Champion Mare, three Class “A” championships, Champion at the 50th Scottsdale show in AOTH, 51st Scottsdale Champion Mare 2 and over, Reserve Champion at the 52nd Scottsdale Show and US Top Ten Open Mare Halter. Next year we will be expecting a foal by her grandsire *Simeon Shai+ thus having a great, great grand and a direct progeny in this one foal! Are you confused now? Basically we are line breeding back to *Simeon Shai+ through her sire Dreamcatcher SMF who is out of Shaia+ by *Simeon Shai+. Jade Lotus SMF by Ali Saroukh out of Imdals Jade is also expecting a foal by *Simeon Shai+ representing one of our first crosses of Shai+ bred back onto a Saroukh daughter. We know that it works well with a Shai+ daughter being bred to saroukh after seeing the results of Fire Queen SMF out of Shaia+; for us this is a reverse of Ali Saroukh on Shai+ daughters. Nicknamed J. Lo for her wonderful attitude by good friend Beth Mishek this mare never tires of showing off and is sure everyone came to see her. She just makes you smile to see her sassy way of going, we are very excited to see the 2009 foal by *Simeon Shai. 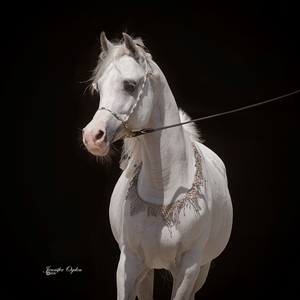 Shai+ is the only Arabian ever to win Scottsdale, Canadian National and United States National Champion plus World Champion at the Salon De Cheval in Paris, France; all of this achieved within a ten month period of time. Shai+ is also an AHA Legion of Honor winner as well as an Arabian Horse World “Sire of Significance”. He has 457 registered first generation foals; 228 mare, 144 stallions and 110 geldings. His second generation progeny total; 1024! 437 Stallions, 310 mares and 117 geldings. There are champions in over ten countries and one on almost every continent. 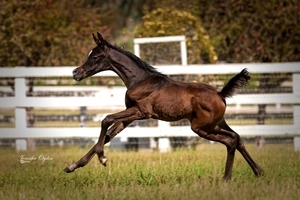 Shai+ is known for contributing athleticism, beauty and the best of personalities to his foals. This has breeders returning to book their mares again and again. *Simeon Shai+ on the way to his presentation party! Whoo Hoo! Free at Last! thank you Ashley and Emily! Hey Ron, what’s with the organic carrots?! Emily gives Shai more cake and then they are off to see his fans. Joan Palelek reaches out to touch Shai. Henry and I wish to thank Mr. Richard T. Bryant for being the SMF Photographer for the celebration; not only do you take fabulous photos but you are a true friend.